There was absolutely no similarity between a ‘Carry On’ movie and the installation ceremony at Compass Lodge No 7052. Well maybe just a couple. The lines throughout were delivered perfectly, with a smattering of humour to lighten the mood. The past master’s and officers were delighted when Mike Hilton agreed to “carry on” as WM for a second term. The evening began when all members and guests were seated. The DC Jim Hawkins asked the deacons (one of whom was Jimmy Murphy of Harmonic Lodge No 216, who had kindly stood in at short notice), to lead the principal officers into the temple. During their entrance, the gathered brethren tunefully sang the opening ode. 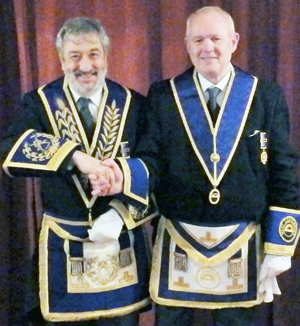 WM Mike, greeted the brethren and with the assistance of his wardens, opened the lodge in the first degree. The minutes of the previous meeting having been circulated electronically, were confirmed and signed. Jim Hawkins then retired and, on his return, announced that Sydney David Ford, the representative of the Provincial Grand Master was without and sought admission. The brethren stood to receive Sydney Ford, together with the group vice chairman John James and David Potts. Two acting Provincial grand officers were also in attendance, Dr Peter Lindfield and Compass Lodge member Malcolm Hodgson. Mike welcomed Sydney and said that he hoped they would all have a pleasant evening. Sydney is well known to the members of Compass Lodge, as at one time they were part of the Garston Group, during Sydney’s tenure as the Garston Group Chairman. The lodge was then opened in the second degree, whence Mike requested Gary Eckersall to continue to occupy the senior wardens chair, John Jackson to occupy the junior wardens chair and Ken Jones to act as inner guard. The lodge was then opened in the third degree. Jim then called upon the brethren to salute Sydney, John and David. Sydney thanked the brethren and greeted them well. Jim then called the brethren to order, to salute Ian Winston Elsby and the rest of the Provincial grand officers. Ian thanked the brethren and greeted them well. When labour was resumed in the second degree, David Potts declared Mike as WM for the ensuing year. All of the working tools were delivered and explained by David Potts. Mike then appointed his officers for the ensuing year. Roy Williams as immediate past master, Dave Smith as SW, Gary Eckersall as JW, Ken Jones as Chaplain, Harry Binks as mentor, Jim Hawkins treasurer, Steve Dudson secretary, David Potts DC, Ray Hope senior deacon, Mike Crangle junior deacon, Colin Douglas IG and Brian Jones as tyler. All those present were thanked and congratulated by Mike. Those not present will be collared at the next regular meeting. David Potts (left) congratulates Mike Hilton. Ken Jones gave a faultless address to the wardens and Sydney Ford, with his many years of experience, also gave a word perfect address to the brethren of Compass Lodge. At the conclusion of the ceremony, Sydney rose to convey the congratulations of the PrGM Tony Harrison to Mike and all the officers who had taken part in the ceremony. Mike then had a very pleasant and important presentation to make to Sydney, a cheque for the magnificent sum of £750, made payable to the MCF 2021 Festival. Sydney thanked Mike and the lodge for the very generous donation. Following the first rising, Sydney and the rest of the grand officer’s retired, to enjoy a pre-dinner drink in the Crosby Suite of the Adelphi Hotel. With the lodge closed in due form and perfect harmony, the other members and guests made their way to the Crosby Suite, to enjoy a fine three course dinner, accompanied by a selection of wines and a glass of port. Mike took delight in taking wine with all the brethren present at various times during dinner. During his response to the toast to his health, Mike mentioned John Cairns who had over the years established a bond between Compass Lodge and Harmonic Lodge, which continues up to the present day. 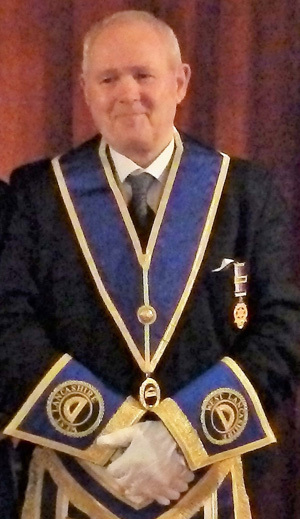 John, now residing in the ‘Tithebarn’, although unlikely to attend any future meetings, remains a subscribing member of the lodge. Compass Lodge had the name recommended, during a meeting of founder members prior to its consecration in 1951. It was discovered that the sponsor for the proposed new lodge, Mariners Lodge No 249, had held its first meetings in a tavern called Mariner’s Compass, a perfect choice of name of the new lodge. Sadly, Mariners Lodge no longer exists. All too soon it was time for the last toast of the evening, which was in the hands of the tyler, Brian Jones. The end of a very memorable evening for Mike, the brethren of the lodge and their many guests. Pictured from left to right, are: Malcolm Hodgson, John James, Sydney Ford, David Potts, Mike Hilton and Dr Peter Lindfield.